Population 31 million, mixed Human and Gummi with significant populations of their entrained species. San Agustín orbits a white star on an eccentic orbit, with a high axial tilt. In the southern hemisphere, summer (when the south pole is pointing toward the sun) comes when San Agustín is at its farthest point from its sun in its yearly orbit and winter is when it is closest. For the northern hemisphere, the reverse is true. Consequently, the south tends to have what would otherwise be severe seasonal changes moderated by the changing insolation while the seasonal differences are exacerbated in the north. Naturally, most of the planet's settlements are in the southern hemisphere. Oceans cover only 38% of San Agustín's surface, leaving much of the planet a desert. What oceans can be found are significantly saltier than those of Earth. Areas near the oceans often get adequate rainfall, and latitudinal bands corresponding to rising Hadley cells are blessed with relatively more precipitation than elsewhere. Nonetheless, San Agustín is, overall, a comparatively arid planet relative to most other inhabited worlds of the Verge. A terror eel emerges onto a dock. Terror eels are bio-engineered predators derived from Terran bony fish and adapted to San Agustín's hypersaline oceans. 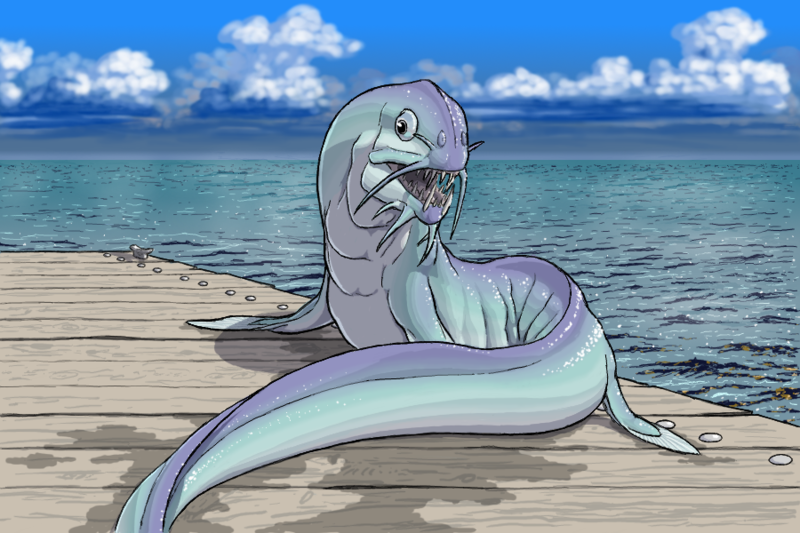 Able to spend considerable time out of water, terror eels are often encountered foraging out of the water. Their strong predatory instincts and large size commonly lead to attacks on sapient people. The native land life of San Agustín consisted of autotrophes roughly equivalent to simple mosses and lichens, and tiny animals vaguely like mites and tartigrades. The ocean life is more diverse and complex, consisting of fish-, worm-, and vaguely shrimp-like things, some of which grow to large sizes. This native terrestrial flora and fauna did not compete well with the introduction of alien animals and plants from both Earth and Gummiland. Today, within hundreds of kilometers of settled areas one can find broadleaf hardwoods and conifers growing alongside screw-feather trees, grasses jostling with lip-bulbs, bracken and brush crowding alongside polyp bushes and duster scrub. Mud rubbers and pudding grubs creep under rocks and fallen logs, next to snakes, spiders, scorpions, ants, earwigs, millipedes, and centipedes. Lizards bask near puffing bunkles and death snails. Deer browse and eland graze next to walking carpets and fuzz-rugs, hoovers and lasso beasts. Coyotes range, leopards stalk, spaghetti trappers lurk, spitters creep, and netters patiently wait. The oceans are saltier than most Terran aquatic life prefers, although brine shrimp and alkali flies do well and Gummiland wigglers and darters have established and expanding populations. There have been some attempts to bio-engineer terran bony fish and molusks to tolerate the increased salinity, some of these have gone on to become invasive and even problems for coastal communities. The native sea life is nonetheless thriving despite the presence of alien life forms, with the newcomers mostly taking otherwise unoccupied niches. Lakes and rivers often have trout, bass, bluegill, perch, catfish, and crayfish. San Agustín was once a backwater planet of a few dusty small towns, settled primarily by southwestern and midwestern Americans, Bangladeshis, and Caribbeans displaced by rising sea levels. Locals in their pickup trucks and sky lifters, feed stores and hydroponics farms, dirt roads leading nowhere. Then one day a new hole appeared. The space-time near the Hendrickson's barn on their farm on the outskirts of Playa puckered and warped, twisted into unnatural shapes by exotic fields. Jonah Hendrickson was not facing the expanding wormhole, intent as he was on fixing a leaky pipe. He did not observe as it grew, sucking in first air, then dust and sand, and finally clumps of dirt and dry grass dragged up by its roots. When the tractor beams finally latched onto the side of the barn and began wrenching off slats with cracklings and crunchings, Jonah finally turned around to see the growing space-time anomaly in his yard. Now Jonah had heard about the Homesteader's desperate fight against the Zox, and the devastation the Zox had wrought on Gateway, Austen, and Kartanum. He ran as fast as his legs could carry him back home, to call the sheriff and grab his launch gun. What he did not know was that 5-year old Alice Hendrickson had been playing on the other side of the barn, pretending to bake pies out of mud. When Jonah came tearing back, gun in hand, he was horrified to see his daughter holding out a baking dish full of mud to an orange pulsating, shapeless thing. With Alice in the way, he could not shoot as the hideously amorphous monster stretched out a pseudopod toward his child – and delicately took the dish from her. It seemed to be investigating its gloppy gift for some seconds, then extruded a shiny orb from within itself which it – handed is perhaps the wrong word, for it had no hands, but offered, at least, to little Alice. Delighted, she took the gadget which soon began blinking and hovering in mid air. Soon Alice and the alien monster were playing catch the hoverball. By the time Alice had engulfed the hapless thing in an enormous hug, her father had lowered his gun. And so the first contact between Humans and Gummis began peacefully. The exploration team came through, with a dozen Gummi explorers, a small Pirang pack, and two Tweechi scouts. The people of Playa came out to see their visitors from afar, cautiously at first, but it soon became apparent that their alien guests meant no harm. The Sangas and Gummis traded and gave each other gifts, and after the explorers made their report the Gummis sent a permanent representative to stay with the settlers of San Agustín. Soon, sleepy little Playa had become a bustling interface between two great starfaring cultures. Trade in exotic goods coursed through the mighty wormhole stations, accompanied by exotic people and exotic ideas. The pulse of commerce made Playa rich, and by extension all of San Agustín. The Hendrickson farm became Contact Park, a patch of vegetative green and orange surrounded by the metropolis that Playa had become, with a statue of little Alice handing Huubuuruu the explorer a mud pie to commemorate the historic meeting of the Humans and Gummis. San Agustín's importance as a nexus of trade has stood it over during the upheavals the Verge has endured. The Bump in the Night, although chilling, showcased the importance of cooperation between the Humans and Gummis in which San Agustín served as a vital link in the exchange of goods and knowledge that allowed both peoples to survive. San Agustín has a fairly unremarkable governmental structure based on the American model. This is complicated somewhat by the large population of Gummis who do not naturally recognize or defer to civic authority. At the local level, city councils often take on a hybrid nature of elected and assigned authority with volunteer committees organized by consensus. The meeting of cultural methods has not always worked smoothly, but fixes have been made when problems arose and experience in multi-species governance and coordination has been accumulated over the gigaseconds (centuries). San Agustín is a cosmopolitan blend of ethnicities and species. Nearly every sapient species of the Verge (except for Squirm) are represented here, either in their own communities or integrated into blended neighborhoods. The people of San Agustín are commonly referred to as Sangas. The food of San Agustín is a real mix, with traditional American, Mexican, Caribbean, Bangladeshi, and Chinese cooking exist side-by-side with Gummi, Tweechi, and Pirang fare. Many fusion styles have evolved, combining elements of several culinary arts into novel taste sensations. Most people of San Agustín speak either English, Sequential, or Hooning. Many have learned both English and Sequential (or, if Gummi, all three languages). Humans commonly also speak Mandarin, Spanish, Bangla, or Arabic. Consistent with its cosmopolitan nature, you can find followers of many different faiths on San Agustín. The Originalist Catholic Church has the largest following, followed by Uumuuluu, Buddhism, Islam, and LDS. Although not numerous, San Agustín nevertheless has the largest population of Hindus in the Verge. Playa is a thriving port city, with immense lots of stacked shipping containers, cranes, hoists, loaders, and railways of nearly a dozen parallel tracks connecting the wormhole to Bondle with the station with wormholes to New Carolina (via Noether and Ash) and Valleya (via Avalon). This meeting of cultures produces a city with a mix of architectural styles – block Human houses and high rises jostling with organically mounded and lumpy Gummi constructions. The bazaars and open-air markets throng with shoppers and merchants selling their wares, forming labyrinthine assemblages of alleys, stalls, and small shops, and are known as places where one can find nearly anything. Playa is built up on the shore of a dry lake. The lake occasionally fills during the wet season in years of particularly high rainfall. The climate is dry, and scrub vegetation grows in undeveloped and un-irrigated land above the lake basin. Within the city itself, municipal water allows lawns, trees, gardens, and vegitative landscaping using both Earth plants and Gummi autotrophes. In high winds, dust and salt from the lake's saltpan gets blown into the air, forming dust storms that send most of the people indoors.